Easter is a fantastic time to discover the Via Francigena, particularly if you’d like to experience Easter in Italy, its unique celebrations and traditions. Many cities and towns across Italy, big and small, hold Easter processions during Easter week or ‘Pasqua’, generally starting on Palm Sunday (20th March in 2016) and up to Easter Sunday and Easter Monday (called La Pasquetta). But Easter in Italy is not just about processions and religious ceremonies, you are also in for a treat. This time of the year, you will find the traditional chocolate Easter eggs, as well as many other sweets and cakes; so you can celebrate the end of frugal Lent. 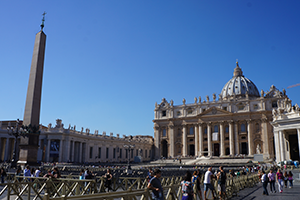 Rome and the Vatican have been traditionally an important Easter destination for pilgrims, both on the Via Francigena or just visiting the city. A Holy Mass takes place at Saint Peter’s Square on Easter Sunday, attracting many visitors. It is a free and very popular event so be there early and prepare to queue. At noon, the Pope gives his traditional Easter message at Saint Peter’s Basilica. However, the most important Easter event in Rome is the Via Crucis taking place on Good Friday. The Via Crucis or Stations of the Cross depicts the most dramatic moments of the Passion of Christ from station to station, starting from the Colosseum and finishing at the Temple of Venus in the Roman Forum. Fireworks at Castel Sant’Angelo officially close the Easter celebrations in Rome. 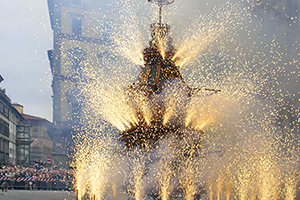 The Scoppio del Carro or Explosion of the Cart is another traditional Easter festival in Italy, taking place in Florence, Tuscany’s capital and starting point of the St Francis Way or Cammino di Francesco. The Explosion of the Cart takes place on Easter Sunday and dates back to the time of the Crusades. This explosive celebration starts in the morning and involves a wooden cart being pulled by six white oxen. The cart carries coals lit by the Easter candle to be delivered to the Archbishop of Florence at the city’s cathedral, the Duomo. Once there, the Archbishop uses this ‘Holy Fire’ to light a rocket called Colombina (it is in the shape of a dove) which in turn will light a set of fireworks placed on the cart to the delight of onlookers. 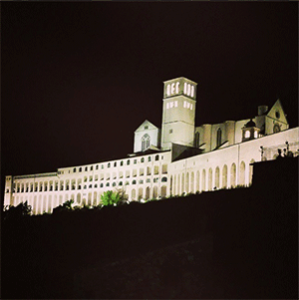 Assisi and Gubbio in Umbria, both on the St Francis Way, also host important processions during Holy Week. The city sanctuary and birth place of Saint Francis kick starts the week with a blessing of olive branches on Palm Sunday; but the most important ceremonies will take place on Holy Thursday and Good Friday. If you are walking the St Francis Way or the Via Francigena, Camino to Rome this Easter, we’d like to wish you a Buona Pasqua! I’ve taken my kids to the Scoppio del Carro, and it’s a great event!